Does Your Organization Have Multiple Personalities? Whether you like it or not, your customer service is now part of your company’s public relations. In reality it has always been that way but now, with the variety of online tools that let individuals have a louder voice, many more people can hear about your customer service successes and failures. Customer service is one of the many ways you can put social media tools to use – identifying customer issues early and resolving them to create happy, satisfied customers. Whether it’s through focused tools like Get Satisfaction or through a coordinated listening and engagement program, there are plenty of ways to go about it. On a daily basis we’re blown away by the power of tools like Radian6 for coordinating this kind of effort. Respond to customers online and they can be blown away that you’re listening. Frankly, most people don’t yet expect it. We’ve seen from our own clients that the response you can get from effective online service is powerful. What happens, though, when your offline customer service function doesn’t live up to the expectation for service standards you’ve set online? You end up with an organization with multiple personalities. Online, your company is friendly, responsive, and goes beyond the minimum to set a gold-level standard. Offline, your call centre staff are assessed on turnaround time on calls, and are focused on getting you off the line as quickly as possible. The person who gets prompt, friendly, personal service online one day and then the next day gets put on hold to a call centre in India for 90 minutes will have an even more negative perception of that phone experience due to that contrast. What’s more, they’re likely to continue to rely on your online service in future, by-passing the other options. Is that the kind of consistency you aim for with your brand? I hope not. If you’re starting to tune-in and listen to conversations about your company online, pay close attention to what people are saying. Are they consistently complaining about your offline customer service? If they are, while you stand to benefit from outreach through social media tools, you need to take a long, hard look at the rest of your customer service operation. You are dead on. A company can do all of the PR and branding it wants through all sorts of media, but ultimately a customer’s experience doing the simplest transaction is what determines their feelings for the brand. Beavers or no beavers I loathe Bell because they could never get my bill right. Rogers Hi-Speed never goes down for me but they’ve got my bill wrong for the past four months – clever advertising and even the fact that someone responded from Rogers on Twitter doesn’t change the fact that their call centre can seem to solve a simple problem. And while being on Twitter is all the rage, many brands show concern when you mention their brand negatively, but after that become unresponsive when you ask them to actually help fix the problem. Brilliant post, until organizations treat front line customer service as the most important branding tool in the “tool box”, we will still see people recount their frustrating experiences with Telecom/Wireless/Cable call centres on different social media platforms. 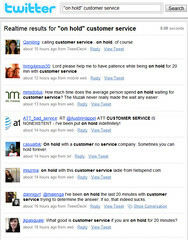 Using social media to respond to customer complaints is putting a little band aid on much bigger problem. Excellent, once again. One of the reasons we’re so passionate about a listening “grid” approach – integrating social media monitoring and outreach across the organization – is exactly this issue. Our expectations for companies are changing daily, and a consistent experience is what customers are asking for. They don’t distinguish between social and non-social channels. As a consumer, I expect to be treated the same whether I’m reaching out via email, the phone, Twitter, or in person. The companies leading this space are making big strides toward breaking down internal barriers and integrating the culture of social communication into more analog practices. Thanks for the great post, and the shoutout as always. I totally agree. My perception of a company is usually formed by my experience with the customer service line, which is sadly, often negative, even if I think the company’s products/services are great. In his book, Satisfied Customers Tell Three Friends, Angry Customers Tell 3000, Pete Blackshaw addresses this very issue and suggests that poor customer service is the downfall of many great organizations. Very excellent comments. A happy customer can be a company’s best advocate and ignoring an unhappy one is like shooting yourself in the foot. Several times. 360° evaluations may sometimes be difficult to swallow but ultimately it is the negative comments that help us provide better products and customer service because they reveal the inconsistencies and problems that need to be corrected. Dave, this is an excellent post. You are absolutely correct. Companies need to better monitor what is being said about them and then improve accordingly. With internet and WOM marketing, negative comments about your company spread so much faster AND people are more likely to pay attention to the bad reviews than the good. You need to really listen to what is being said and don’t be afraid to change for the better!